Nearly four out of five new homes built in America use manufactured roof trusses to frame the roof. Prefabricated trusses replace the rafters and ceiling joists used in conventional framing. The use of trusses enable the general contractor to construct homes that have more complex roof and ceiling designs with greater speed and accuracy. Less skilled carpenters can be utilized to erect the trusses resulting in lower labor costs. These cost savings should reduce the price of nearly any new home being built. Ask nearly any modern builder and they will probably tell you that prefabricated trusses are much better for the bottom line than conventional roof framing. Trusses span longer distances and eliminate the need for inside load bearing walls. Less costly than stick roof framing because they are made of shorter lengths of two by four stock as opposed to the larger framing members required of conventional rafter and ceiling framing. Trusses can be designed for nearly any ceiling or roof combination required in modern custom homes. 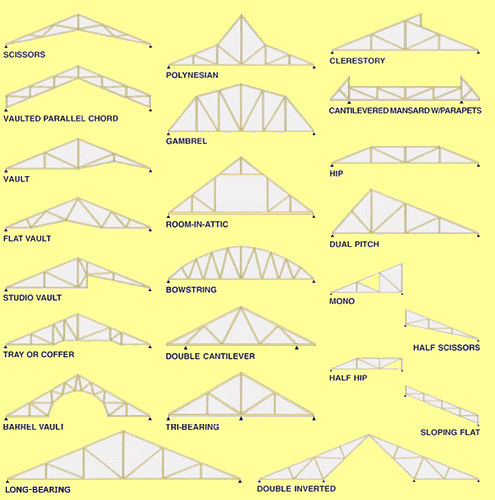 Trusses are designed by engineers to meet the roof load and building code requirements. Trusses can usually be erected in one day, reducing the amount of time the inside of the new home is exposed to outside weather conditions. Less experienced carpenters can be used to erect trusses, further reducing labor costs. Top chord to which the roof sheathing is applied. Bottom chord to which the drywall or other finished ceiling is attached. Bearing point , where the common truss is designed to sit on the outside bearing walls. Web supports are utilized to hold the top chord in the proper position, at intermediary points from the peak to the bearing point. 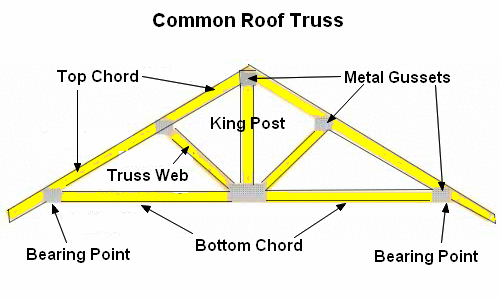 King post is used to help support the peak or top of the common truss. Metal gussets are used everywhere the web supports and king post intersect the top and bottom chord as well as at the bearing point. Tail of the truss is used to make the eave or overhang and provides a way to attach soffit and fascia. Raised heel trusses are taller at the bearing point and allow for additional insulation at the outside edge of the building. Scissor trusses are normally used to form a cathedral ceiling. Hip trusses are used to frame a hip roof and available in three basic types, terminal hip truss system, hip master truss system, step down hip truss system, and Dutch hip truss system. Girder trusses are used to eliminate the need for a load bearing wall and placed where two roof lines intersect. Mono trusses are half of a common truss and usually placed at a ninety degree angle to the girder truss. Room in attic trusses come with the bottom chord utilized as the floor joist and the support webs designed to frame the walls of the room. Gambrel trusses are used to form a gambrel or camel back barn style roof. Polynesian trusses are utilized to form a Polynesian style roof. Bowstring trusses are used to form a rounded or barrel roof. Tri Bearing as the name implies has three bearing points instead of the normal two and used on larger trusses. Multi piece are trusses that stack on top of one another when a single truss is too big to be shipped over Americas roadways. In addition to the many roof trusses available there are also many different ceiling configurations possible with modern trusses, including but not limited to.